Place the bread cubes evenly on a baking sheet. Melt 2 tablespoons butter and pour it over the cubes. Bake until lightly golden in color and slightly dried out, about 15-20 minutes. In a large skillet, melt the remaining 2 tablespoons butter over medium heat. Add the sausage and cook for 5 minutes, crumbling the meat with the back of a spoon. Add the onion and cook until tender and the meat is browned, 7-10 minutes. Transfer the mixture to a large bowl and let cool. Add the toasted bread cubes, stock and eggs to the bowl and mix well (use your hands if you like – it’s fun!). The mixture should be moist but not soggy; add a little more stock if you like your stuffing wetter. In Recipes-list.com we have selected the most viewed recipes from category - uncategorized . Enjoy the best recipes specially selected for you! 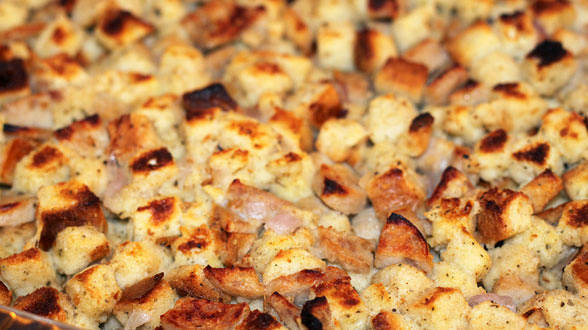 5 Ingredient Thanksgiving: Apple Sausage Stuffing is the right choice that will satisfy all your claims.